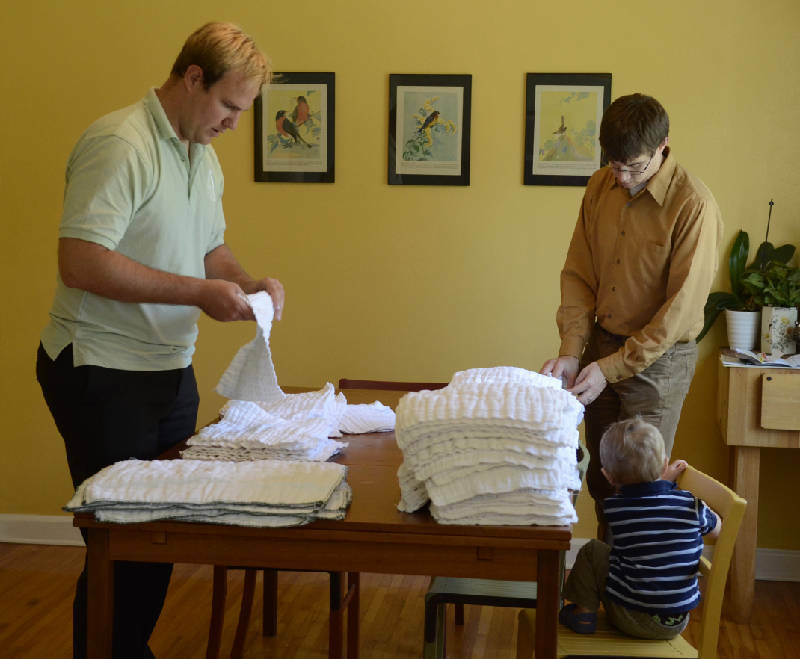 Lee Gates, left, and Jason Mitchell, two of the owners and operators of Wee Care Diaper Service, sort and stack laundered cloth diapers for a customer's order while Jason's 2-year-old son, Caleb Mitchell, watches. Products/services: Cloth diaper washing service that provides parents with clean diapers every week. Parents can drop off diapers at one of two Chattanooga sites on Saturdays for $16.99 a week or receive weekly home delivery service for $26.99 weekly. Getting started: Jason Mitchell and one of his co-owners were watching an episode of the TV show "Dirty Jobs" about a diaper service and realized Chattanooga was lacking such a business. "We talked about it for a while and then ran into another friend that was expecting his first baby and had had the same idea," Mitchell said. "We decided to join forces and collaborate together." Soon after, Wee Care Diaper Service was born. Why cloth? Mitchell said there are a number of reasons to use cotton over disposable diapers. "It's cloth that's against the baby's sensitive skin instead of a plastic substance," he said. Mitchell also said babies in cloth diapers tend to potty train significantly earlier because they are more able to tell when their diapers are wet. Target market: Any parents needing diapers, but Mitchell has found first-time expecting parents the most receptive to the service. It's easier for people to chose cloth when they haven't already gotten into the habit of using disposable diapers. Biggest hurdle: Getting in touch with potential customers. "We've received a lot of good feedback, it's just a matter of connecting the service we'd like to provide with the people who are making the decision," Mitchell said. He hopes as more people use the service, it will grow through word of mouth. Five-year goal: Expand the number of drop off locations and capture about a 20 percent of the local diaper market. "That would be a pretty huge jump from where things are at today, but we're hoping as people see this as another option we could really see participation jump," Mitchell said.